As someone who has seen dozens of melanistic gray squirrels, I can say that this is one of them. It is not unusual to find melanistic individuals with gray or brown banding on their hairs. I have seen these black squirrels with red tails– and they definitely were not fox squirrels. The tail was pure golden red like a golden retriever, not sabled like a collie, which indicative of a northern fox squirrel. 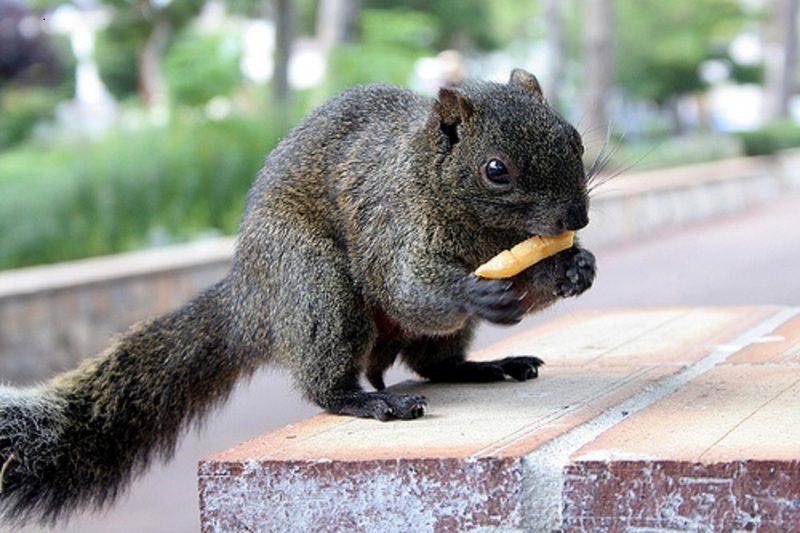 As someone interested in the genetics of color, I find the melanistic squirrels fascinating. I don’t think I knew about them until I went to Ontario for the first time, near London. My boyfriend found my interest in them amusing, since he’s been there most of his life and thought all squirrels come in black and agouti! When I’m there I’ll often spend hours sitting in parks, watching them. Along with solid black I’ve seen lots that look like this, ones that are more of a liver color, and all sorts of variations.